When PMA first spoke to Jono Bredin (pictured left, with thanks to Kenneth Lim) earlier this year, he expressed his desire to one day satellite into the annual NZPT Snowfest tournament played in Queenstown amid New Zealand’s Southern Alps. 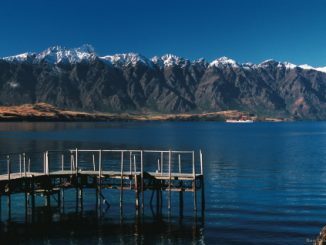 Not only did he achieve his goal, the 23-year-old from Melbourne’s southern suburbs is the chip leader heading into tomorrow’s (Sunday’s) final table at SKYCITY Queenstown. 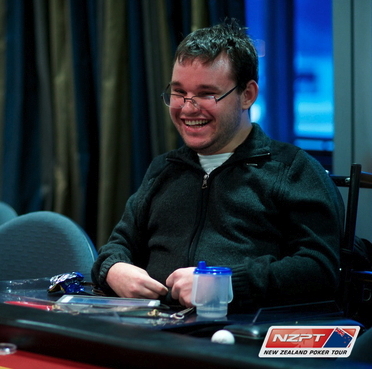 Bredin, who has Cerebral Palsy and requires the use of a wheelchair, holds 657,000 in chips. He did fall behind a few players half way through the day but stormed back to the front again after the bubble burst. Earlier this year, Bredin outlasted all but four players in a field of 445 in the third edition of the Full House Group’s MAIN EVENT at Crown, winning a prize package valued at $25,000. Next in chips is NZ’s Jon Pierre Narbey on 408,000 while Raj Ramakrishnan, who final-tabled the 2009 Aussie Millions Main Event, has 271,000. 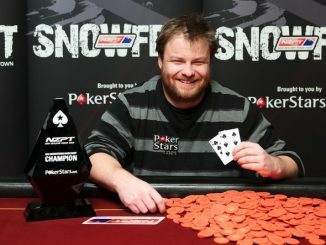 Others still in contention include Ricky Kroesen (241,000), Daniel Neilson (122,000) and Daniel Laidlaw (106,000).